G7c users will now have the option to immediately call teammates on the same channel or to switch channels to easily communicate with other teams. Unlike conventional radios, push-to-talk (PTT) has no radio licensing and no range limit. With 3G connectivity, PTT provides organisations around the world with radio functionality without the need to invest in a separate fleet of radios. 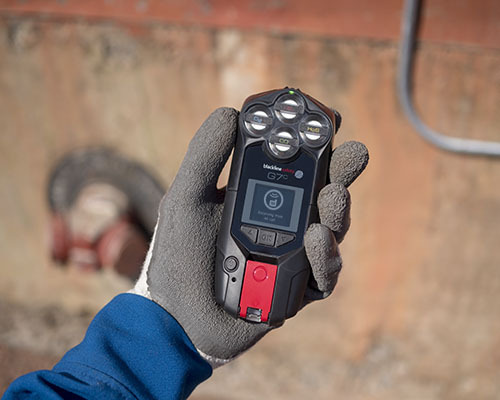 It combines a world-leading gas detector, a lone worker safety monitor and a two-way radio. Plus, it eliminates the need for employees to wear and charge multiple devices. With 100 channel options, PTT gives lone workers the ability to instantly connect to supervisors and team members without interrupting their workflow. Like a two-way radio, users can communicate with other devices on the same channel. G7 devices with PTT also features an all-call channel for emergency broadcasts to every device in their organisation — making it ideal for safety supervisors or managers to quickly alert lone workers in an emergency situation. Blackline’s connected safety solutions are highly configurable, and PTT is a valuable real-time safety feature that can be added to expand the functionality of a user’s G7 device. Through the Blackline Safety Network, businesses can monitor the whereabouts of their teams in real-time on a live map and identify their ongoing safety status. In Blackline Live, businesses can store custom emergency response protocols to direct monitoring personnel during an emergency alert. PTT empowers real-time communication between team members and supervisors throughout the workday. Should a worker encounter an incident, G7 safety solutions deliver the tools necessary to manage the fastest possible emergency response. From onset through to resolution, Blackline has your back.